Jesus said: "I am the living bread that came down from heaven; if any one eats of this bread, he will live forever; ...he who eats my flesh and drinks my blood has eternal life and ... abides in me, and I in him" (John 6:51, 54, 56). The Most Holy Eucharist is the most august sacrament, in which Christ the Lord himself is contained, offered and received, and by which the Church constantly lives and grows. The Eucharistic Sacrifice, the memorial of the death and resurrection of the Lord, in which the sacrifice of the cross is perpetuated over the centuries, is the summit and the source of all Christian worship and life; it signifies and effects the unity of the people of God and achieves the building up of the Body of Christ. The other sacraments and all the ecclesiastical works of the apostolate are closely related to the Holy Eucharist and are directed to it (Canon Law 897). The Family and Children's Faith Formation Program is available for children who need sacramental preparation for First Reconciliation and First Communion. 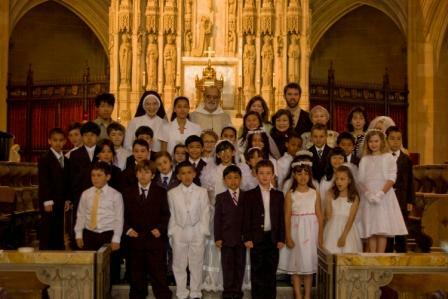 Children in the 2nd grade and above are eligible to prepare for these Sacraments, provided they have been attending Mass, learning their prayers, and learning stories from the Bible. Classes are held Sundays from 10:30-11:30AM or 2:45-3:45PM from September through May in the school building at St. Dominic's. For information, contact the Director of Family & Youth Ministries, Kathy Folan at kathy@stdominics.org or (415) 567-7824 ext. 111. Fill out and submit an CFF Registration Form at the Children's Formation Page. Adults interested in participating in full communion with the Catholic Church are invited to participate in the Rite of Christian Initiation for Adults. Contact Michael O'Smith, Director of Adult Faith Formation, at (415) 567-7824 ext. 102 or michaelosmith@stdominics.org for more information. Please contact Br. Michael James Rivera, O.P., (415) 567-7824 ext. 117, if you or a family member cannot attend Mass and would like to have the Eucharist brought to your home.